​​Adrien Broner was always just the undercard. A ​Manny Pacquiao-Floyd Mayweather rematch has been in the works for quite some time now, but with both fighters over 40 years of age, they're running out of time to keep the public interested enough to cash in on this opportunity. After Pacquiao handled Broner, the 40-year-old challenged his 42-year-old counterpart who was sitting ringside. Mayweather's inability to commit to such a fight is probably just a financial stunt as he tries to up the price of said event and increase his team's share. Floyd's been semi-retired for quite some time now, taking up the role of promoter rather than putting himself in harm's way. But money has a greater influence on Mayweather than any one boxer, and the writing is on the wall here for another edition between these two legends. Pacquiao on Mayweather: I'm willing to fight with Floyd Mayweather again. If he is willing to comeback to the ring. The last fight between these two boxing behemoths was a surprising snooze-fest, with both posturing in the ring rather than going for the knockout. That fight fit Floyd's style rather than servicing Pacquiao. 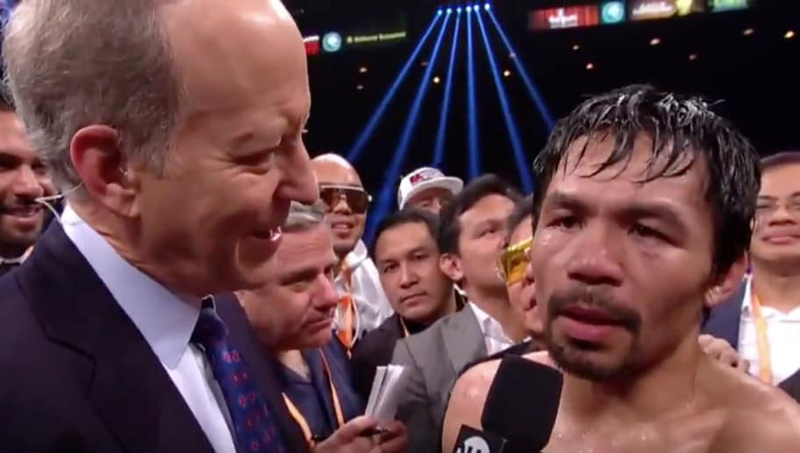 With the public clamoring for a rematch, Pacquiao won't have too much time to enjoy this win.